A father-of-two died on holiday hours after being punched and stamped on in a pub fight, a court has heard. Simon Marx was found to have suffered a slow bleeding brain injury, following a violent attack at the Newton Arms in Normoss, Blackpool, Preston Crown Court heard. He was found dead by his partner of five years Louise Darnborough at a hotel in Turkey 29 to 30 hours later – two days before his 43rd birthday. 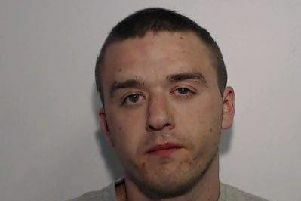 Steven Christopher Lane, 29, of Shalgrove Field, Fulwood, Preston, is accused of murder and of causing grievous bodily harm to Mr Marx’s friend, Rick Alston, by glassing him. Co-defendant David Easter, 54, of Heron Way, Blackpool, is also accused of murder. Prosecuting, Gordon Coles QC said Mr Marx was subject to blows and stamps punches from Easter and stamps inflicted by Lane. He described a background in which, in April last year, Mr Marx’s friend, Gavin Ramsay, had spoken to defendant Steven Lane about an “issue between them” about something Lane had reportedly been saying. The court heard on October 6, Mr Marx went out drinking with Mr Ramsay and friend Rick Alston. They were dropped off at Marton Social Club around 6.30pm and consumed five or six pints of lager or cider each, before taking a taxi to their regular pub, the Newton Arms, at around 10pm. There were several other regular customers in this part of the pub who are known to them, including Gavin’s brother, Gareth Ramsay. Lane, Easter and his son Joe, and their friend David Formby also met in the pub at 10pm that night. Mr Coles said: “Gavin Ramsay noticed Steven Lane in the lounge area, and offered to buy him a drink, which was accepted, and the two appeared to have resolved any previous issues that occurred in April. Ramsay returned to the Vaults, and the defendant Lane and his group remained in the lounge area. He said both Ramsay and Lane’s group then went outside. “Fifteen to 20 minutes later, it seems hostilities resumed. Roy Croft, a friend of Simon Marx, approached the table which Lane and Easter were sitting and it was at point, we say, Mr Lane said aggressively, that the next person who came in would be ‘glassed’. The court heard Mr Croft reported what was said and Gavin Ramsay went to speak to the group in an attempt to diffuse the situation. Simon Marx was seen to approach Lane’s group a number of times, latterly with Rick Alston, who were agitated by what had been going on. Mr Cole added: “The violence inside started, we say, as a result of David Easter punching Simon Marx a number of times to the head or face and those punches caused him to fall to the floor. He tried to get his feet, but was knocked back to the floor very very quickly. "Bearing in mind what had just happened with Mr Easter, bearing in mind where Mr Marx was standing, we say the inference is it was Steven Lane who knocked him to the floor the second time. “Simon Marx was stamped on by Steven Lane while he was unconscious on the floor. The court heard Roy Croft saw Steven Lane stamping down with “incredible force” to Mr Marx’s head. His leg was raised fully and was stamping down some three times. In interview Easter accepted pushing Simon Marx but said his actions were in self-defence and that he would have been unable to punch him due to an injury to his hand. He later changed his account and accepted punching him. In Lane’s first interview he gave a vague account of punching Rick Alston once in “self-defence” but denied stamping on or glassing anyone. The court heard that Lane and the Easters quickly left, with Lane leaving his phone, wallet and keys on the table. Simon Marx regained consciousness after a couple of minutes but was disorientated. An ambulance was called as a result of the injuries to Rick Alston. But Marx had left the pub and remained out drinking before flying to Turkey the next day. The couple arrived at their hotel in the early hours of Sunday. Mr Marx started being sick after having a light meal, but then fell asleep, his partner placing him on his side to prevent any issues with being sick. Lane and Easter were arrested again after Mr Marx’s family contacted police but were released under investigation.